Click if you want to know more about sanitary sensors. The PXM409S Sanitary Metric range Series micromachined silicon transducers with 1½ or 2" sanitary fittings are ideal for pressure or level Clean In Place (CIP) applications in food processing, beverage, dairy, or bio/ pharmaceutical applications. 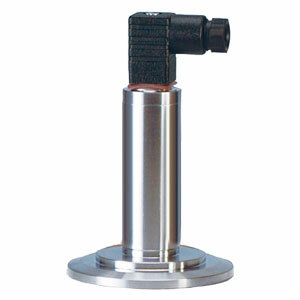 They are also rugged enough for most industrial applications requiring a high accuracy CIP transducer. The micromachined silicon sensor provides a very stable reading with exceptional high accuracy of 0.08% and a broad compensated temperature range of -4 to 85°C on most ranges. The modular construction allows for fast delivery of most configurations and fittings. Plus, customized models also can be delivered quickly to suit your exact needs.